For the past few days I’ve seen this blurry picture of a woman caring for a baby at a restaurant in the left corner, with what looks like a family party in the right corner. 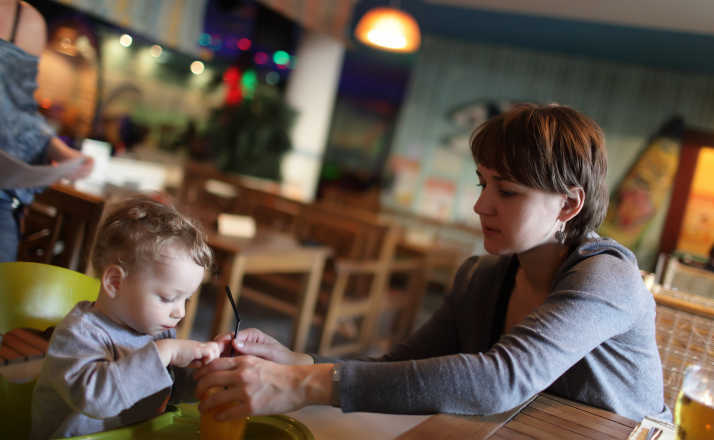 It’s a post on the Facebook page Adult Conversation where author Brandy Ferner describes how this mother walked around the restaurant, entertaining the baby, showing it pictures, and bouncing it, while the rest of the family laughed and ate, never giving her a second thought. The very same day I read this post, we took my son out to celebrate his 12th birthday. I noticed another mom that couldn’t enjoy the party. She gave me a half smile, and rolled her eyes. We have three kids, and luckily they are all, for the most part, past the stage of not being able to sit through a meal at a restaurant. With our oldest, Tristan, Mel was just like that mother in the corner of the restaurant from the viral post. 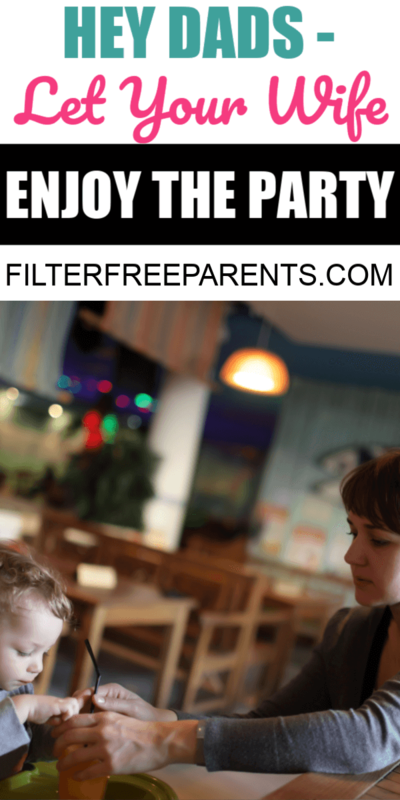 She was the one walking between cafe tables, keeping the baby happy, while the party laughed it up. She was the one taking two hot bites, and getting her food put in a box, and then microwaving it later that night, after the kids went to bed, and eating it alone at the table. She was the one feeling left out, while the rest of us chatted, paying her no attention. And it’s not like this sort of thing was isolated to eating out. It happened at family functions, holidays, birthday parties, church, and wherever adult conversation might happen. Our son was probably two when I started to notice that Mel was absent from all the adult interaction. There wasn’t some dramatic turning point. We didn’t have an argument about it. She didn’t stare at me with angry laser eyes from the side of the room. It was simply this: at some point, I started to wonder why I was the only one enjoying the party. We never really discussed it openly. We just started to split our time at social functions, each of us taking our little one for half the time. Sometimes I took the child first, and sometimes Mel did. We both left having eaten a hot meal, and having socialized. It wasn’t ever 100% ideal, but nothing with young children ever is. Once we started splitting the young child social duties in half, I noticed a few things. Mel enjoyed going out, for example. She didn’t try to find excuses to stay home. She smiled more before, during, and after a party. Her over all mood was better on the drive home. She looked forward to being around our family and friends. When we were out with others, she seemed a little more like the person she was before we had children. Sharing the load and coming at everything equally in a marriage goes far beyond doing the dishes and splitting the laundry. It also looks like taking turns with the children so that both people can socialize. And if one of you is a stay at home parent, this is twice as important because nothing, I repeat nothing, is more isolating than being a stay at home parent with young children. I was a stay at home dad for a short time. Most days I only spoke with my four-year-old daughter, my 6-year-old son, and Dr. Cow (their favorite puppet). I was so hungry for adult interaction that I became depressed. This didn’t mean that I didn’t love my kids. It meant that I was tired of talking about Super Why, and arguing over pants. For the most part I consider myself an introvert, but I couldn’t help but long to chat with other adults while being home with my kids all day. All in all, this is an easy issue that often goes unnoticed. Listen, this is an easy fix. Before you go to that next social gathering, discuss caring for your young ones openly as a couple. Figure out how long you will be there, and split the time in half. Or take the little one 30 minutes at a time. Or figure out who eats the fastest, have them eat first, then swap. It’s not complicated, but it is incredibly important. Next article9 Types Of Moms We See In The Wild – Which One Are You?